I can't believe how long it is since I've blogged. I'm not sure what happened, but we've just been trying to make the most of the summer here in Seattle and my blogging mojo just seemed to get left on a beach somewhere. And funnily enough this is a busy time of year for mirrormirror what with all the pre-Christmas ordering and PR to work on. Thank you so much for all your kind and concerned comments and emails - I'm sorry I just abandoned you without a word - and I'm touched (and somewhat astonished) that people have been missing my somewhat random musings. But anyway, just to get things back on track. Things I've been doing over the last month in no particular order. - Eating Dancing Deer chocolate brownies (perfect for picnics). - Getting really stuck into Project Runway. And Project Rungay. Leanne is my hot, hot favourite. I just wish I'd found my way to her Etsy store before she got famous. - Finally watching Season One of the The Tudors and realising it is much better than I thought it would be. And what a lustbunny Charles Brandon is. - Researching my family tree. And finding out that I come from a long line of Londoners and craftspeople. - Making aubergine (eggplant) and pistachio salad over and over again. It is SO good. - Eating pistachio icecream. I like pistachios. - Getting into a new school routine. The Minx is finally now going to school four days a week, although they are much shorter days, with more commuting. But finally it feels like I have time to focus on stuff. - Photographing new stuff for the shop. - Reading and commenting on other blogs (except for Project Rungay and er, PerezHilton). Sorry fellow bloggers. HOORAY - I am so pleased to 'see' you. Looks like you've been having a wonderful time - gorgeous pictures - your blog has made me want to visit the North West of the US so, so much. Welcome back. Glad to hear you were enjoying life (and TLo) while you were gone. 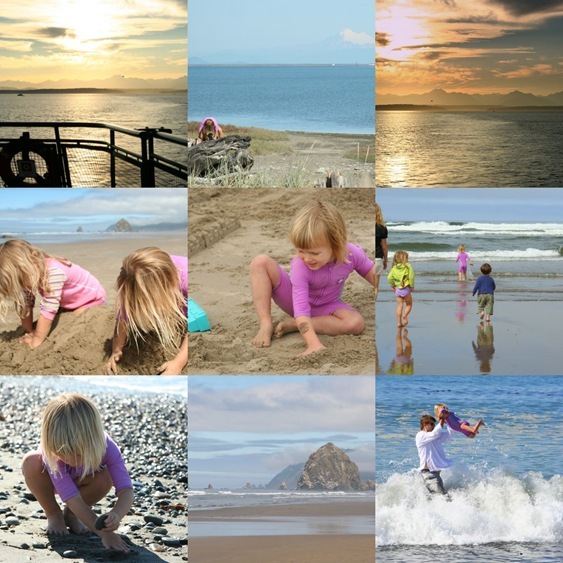 Lovely pics, and you are the third blogger this summer to expound the virtues of Cannon Beach -- must add to my "must visit" list. Another one very glad you're back. Aubergine and pistachio salad sounds rather delish - any chance of the recipe? Welcome back! Glad your time away has been filled with such fun.